Writers Read. We Read a Lot. 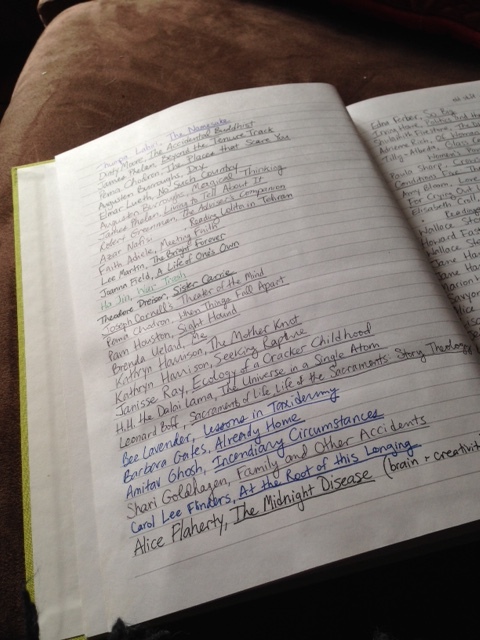 Here’s How to Manage the “To Read” Lists. If you’re just starting an MFA or undergraduate creative writing program, or if you’re not in an academic program but making the choice to devote your energy to writing, you might feel completely overwhelmed by your new awareness of all the book titles zinging around your ears. I remember when I started my MFA program at The Ohio State University (OSU is very emphatic about the the) and suddenly felt very stupid–not only because my peers were writing great stuff, but because of all the books being mentioned, the books and authors named as classics and contemporary models that I had never heard of. I felt so behind, as though I would never, ever catch up. I thought I’d been a voracious reader. I’d read Canterbury Tales and Hitchhiker’s Guide to the Galaxy and Pilgrim at Tinker Creek! (In fact, my entire career would consist of trying to fruitlessly fuse Douglas Adams and Annie Dillard, but that’s neither here nor there). I desperately waited for the feeling of being under-read to go away, and it simply never did. Really. It never has, and I read like a house on fire. I read a lot and I read fast. The truth is that there is no catching up, and that’s a beautiful thing. It means we are simply swimming in language. But this troubling feeling of book-list angst is something I’ve talked about with many students, so I wanted to give a few tips for how to manage and appreciate it. Realize that this state of “I need to read all the things” does not end. You don’t graduate from that feeling, and nobody will look at you and instinctively know that you haven’t read Infinite Jest. The more deeply you get immersed in the writing world, the more you know about. Writers learn that the “need to read this” feeling is just on all the time as background noise. There’s no sense of mastery when it comes to contemporary literature. If you think you’ve got literature down, you might have just watched your curiosity die, which is a troubling thing for a writer. So instead, just get used to this feeling. You’re a writer! Make a “To Read” list and keep it diligently. Add craft books, books on interesting subjects you want to learn more about, anything that catches your attention mentioned in a book review or that comes up in conversation. Students in the Fairfield University Low-Res MFA Program where I teach (unpaid product placement right there–how about some Doritos in the midst of that dramatic moment?) are advised to read 40 books during their time as a student. This seems like a lot but it’s not. You’ll get book recommendations from friends, from the Amazon logarithm, and you’ll overhear a thousand offhand references in the conversations and lectures of writers. Instead of letting those titles wash over you, raise your hand and ask, “Could you repeat that title?” Don’t worry: we all do it. Sometimes writers avoid reading books in their exact genre while they’re deep in the depths of something. At an early stage in the process of dreaming a book into being, they may read books whose voice they want to emulate. You can avoid a certain type of book at a certain time because you don’t want to be influenced by it, but you have to read other things. If you’re a fiction writer, read poetry. Read nonfiction that applies to your subject matter. Browse widely. Pick up a classic you’ve always been meaning to read. But you have to read. Never complain about reading in front of fellow writers. It’s something we don’t forget. Writers read, and that’s it. No argument. If you complain, it honestly makes you look like you’re not serious about your craft. Or like a filmmaker not liking movies? It’s like a weight lifter not liking protein shakes. Or something. This is a shot of my “best books,” the ones that struck a chord, the ones I wanted to be when I grew up, the ones whose voices or approaches I wanted to think more about. Not every book makes the “Special Book” list. Make a “Books I’ve Read” list, and after you’ve finished a book, move it from “To Read” to this list. You’d be surprised how helpful this is, especially as you read more and more. You can completely forget whole swathes of your reading life, and then a few years later you’ll be talking with a writer friend, and they’ll be looking for a book that combines woodworking and multiple points of view, and you can say, “Oh I’ve got the perfect book but I can’t remember the name!” and then there it will be on your list. Make a special list of the books you really want to write when you grow up, the ones from the “Read” list that are so amazing you realize now you couldn’t live without them. I keep this list in a green notebook, and it tracks my development as a writer, in a way. (If you’re interested, I also have a separate book list for creative nonfiction that I teach often. It’s not everything I love, but it’s what I’ve found to work well with beginning undergraduate writers.) If I’m ever feeling down about writing, I just sometimes look at this list, and I feel like I’m in the company of so many daring and inventive writers. This also ends up being your personal intellectual history as a writer. You might not believe that’s important, but it is. Never get behind in your required reading. And take care of your eyes ( It is common at the end of the academic trials to need eye checked and maybe readers – but once you aren’t on the death march of reading, the eyes can recover.) Good luck and have fun! I once had a therapist say to me, when I complained that I always felt like I was in limbo, that life is limbo–that we are always in a state of flux. Ahh, so I guess it’s also common to be in a reading limbo of sorts, feeling forever behind. I love how you put a positive spin on this condition, referring to it as “swimming in language”. That’s what’s truly out of control is my TBR. It’s too chaotic for Goodreads, but I love Goodreads for posting and sharing reviews. Goodreads is the place to go! I love the set up and it keeps me open to suggestions from my family and peers. There I can also take a peek at what others are reading, recommending, or reviewing. I wish I had known about where to log books sooner. Decades have gone by without my noting books read. I’d have to comb through my journals and tease out titles/authors, which would eat up valuable reading time – ha! By the way, I have been directed to your website via Ben Vogt from whom I am taking a memoir writing course. Good luck with Riffle. Don’t you like the name? Sounds fancy and sort of frivolous, which it’s not! You mean I actually have to read the stack of books on my desk? Lol. Thank heavens for kids’ doctors’ appointments and band concerts, giving me the odd hour (more if it’s a band concert) to dig in. The hardest part, I find, is reading authors I don’t already love (there aren’t THAT many band concerts.) I expect that kind of thinking is very bad karma for a writer… perhaps I need to sign the kids up to play more instruments, lol.